Nylon Magazine and Gap join forces for a fashion-styling event with Costume Designer Jenn Rogien of HBO Girls and Netflix Orange Is The New Black, hosted by Nylon Magazine Fashion Market Director Rachael Wang. The wine bar was in full effect with model-type bartenders and tantalizing bites. A wall of 1969 denim showcased on the second floor, racks of light blue and medium-dark chambrays and shelves of classic navy, true red and soft beige corduroys. 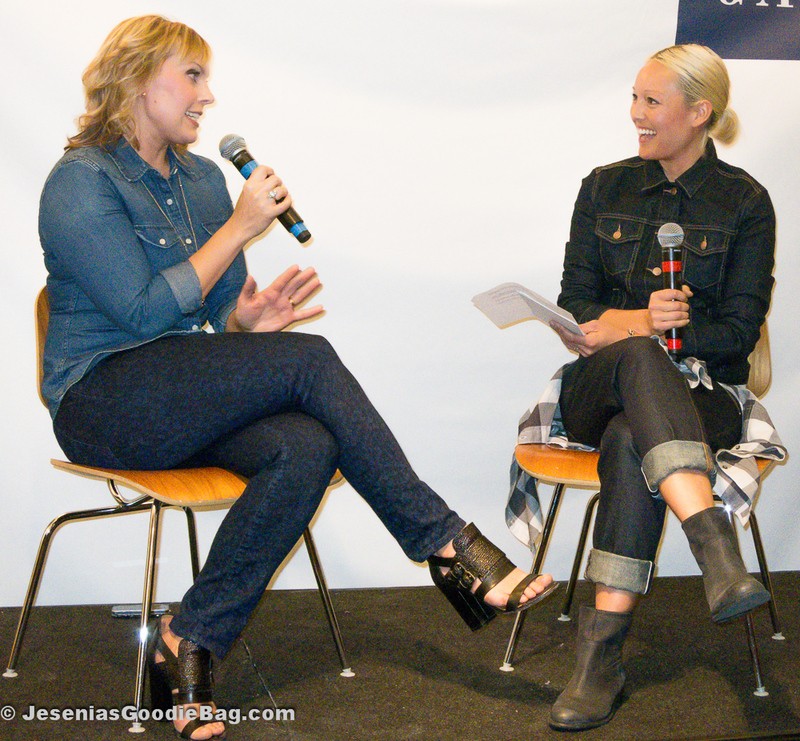 Jenn Rogien reveals to Jesenia’s Goodie Bag four key pieces for Fall 2013. A sweater girl at heart, Jenn loves layering her sweaters with cashmere. The Chambray, as she puts it, are also easy to layer and build around, and carry well into the Fall/Winter season, while printed denim and boyfriend jeans are her new denim crushes. Mercedes-Benz Fashion Week left much food for thought, as Rachael Wang shares her Spring/Summer 2014 favorites with Jesenia’s Goodie Bag, from the return of the Lucite shoe, to the ever dominating presence of sheer fabrics in traditional white and pastel. Before a live audience, Rachael Wang engages Jenn Rogien in a Q&A segment, where Jenn discusses her beginnings, from grade school days in Theater to earning a BFA at Parsons, while working in corporate America and moonlighting as a Production Assistant. On her bucket list of shows to costume design for is the widely popular AMC Mad Men. Audience members chimed in with questions about denim. As a denim girl, Jenn admitted to owning the same Gap jacket since college. For denim-washes she insists it’s all a matter of personal style. Budget-friendly tips included mixing highs and lows from stores like Barneys and Bloomingdale’s, as well as H&M, Zara, Loehmann’s, Forever 21 and local thrift shops. As a Brooklyn resident, Jenn frequently thrift shops in Williamsburg, Franklin Street (in Green Point) and 21 Tara Tibetan store (in Clinton Hill), while people-watching for inspiration.